EDIT: Giveaway is officially over. Congratulations to Huguette English for submitting the randomly-chosen 948th entry. Can you believe my first date with Ogre was on Valentine's Day? I could barely hear him over the boom of my beating heart! It's funny to remember that I was ever that nervous around him, now that we've been together for almost eight years. Our souls are woven together, just like the jump rings in chainmaille jewelry. 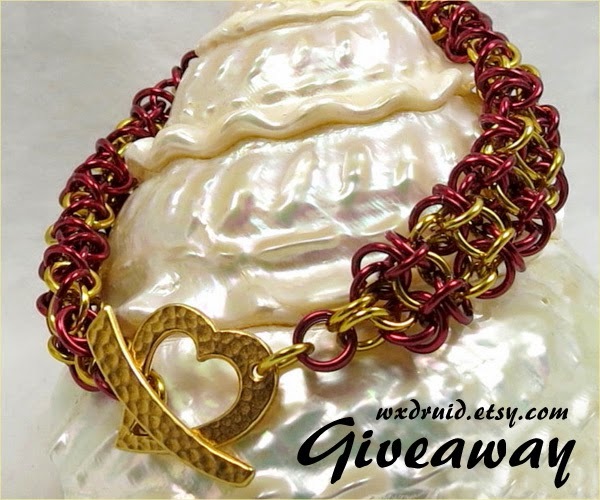 To celebrate true love, Jennifer from WXdruid Chainmail is giving away a heart bracelet for Valentine's Day. The beautiful bracelet was designed using red and gold anodized aluminum jump rings. Jennifer loves working with anodized aluminum because there are so many vibrant colors available to combine in creative ways. She chose to weave a gridlock Byzantine pattern that closes with a golden heart-shaped toggle clasp for the lovely prize. The chain mail bracelet measures 8.5 inches long, 0.5 inch wide and fits comfortably on a 6-6.5 inch wrist with some slack, but can be lengthened or shortened by 0.5 inch and sized to fit. Use the Rafflecopter below to enter to win worldwide giveaway before 11:59pm EST on January 30, 2015. 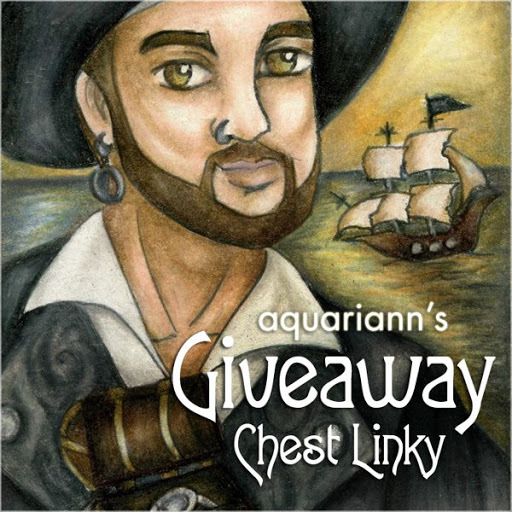 Be sure that the mandatory comment on the blog post includes the same name you use to fill out the Rafflecopter - all entries by winner must be easily verified or a new winner will be chosen. Not including usernames when asked will also get you disqualified. I am inlove with the Beaded Chainmaille Bracelet, Black Full Persian Anodized Aluminum Chainmail Bracelet. It is so gorgeous! I love the wxdruid Chainmaille Dice Bag, European Weave with Brown, Orange and Gold Anodized Aluminum. Beaded Chainmail Bracelet, Green, Gold and Purple Ladder Byzantine Anodized Aluminum Chainmaille Bracelet is my favorite!!! I like the Scale Butterfly Barrette, Orange and Gold. I think it would really pop on my dark hair. Each items listed were unique and particularly made. Impeccable beauty with exquisite designs. My favorite is Dragon Handflower, One of a Kind Black and Gold Chainmaille Slave Bracelet. The combination of black and gold is just majestic! I like the chainmail bracelet with black rubber rings and your choice of metal color! My daughter likes the silver and black slave bracelet. Dragon Handflower, One of a Kind Violet and Pink Chainmaille Slave Bracelet is my favorite! I really like the Chainmaille Bracelet, Green and Gold Gridlock Byzantine!! The Chainmail Jewelry, Red and Black Rondo al a Byzantine Anodized Aluminum Chainmaille Bracelet is one my favorites. The Scale Flower Hair Clip, Handmade Gold and Red Flower Hairpiece, Hair Flower Clip is my favorite. The butterfly items are my favorites! So romantic! Great jewelry for a great story! I really like this Chainmail Statement Jewelry, Ladder Byzantine Necklace made with Swarovski Crystals! I love the Chainmail Jewelry, Blue, Violet and Pink Rondo al a Byzantine Anodized Aluminum Chainmaille Bracelet. I like the Dragon Handflower One of a Kind Violet and Pink Chainmaille Slave Bracelet. My favorite item is a Steampunk Chainmail Bracelet, Purple and Lavender Japanese Stepping Stone Chainmaille Bracelet. Dragon Handflower, One of a Kind Violet and Pink Chainmaille Slave Bracelet is one of my favorites. I love the double flower hair clip! I like Chainmail Statement Jewelry, Ladder Byzantine Necklace made with Swarovski Crystals. I like the Black Chainmaille Choker! Love the Chainmaille Bracelet, Box Chain Weave, Handmade Silver and Ice Anodized Aluminum Chainmail Bracelet! I like the chainmaille bracelets. The green and purple one is pretty! I like the steampunk chainmail bracelet. I really like the color of this one~~~ https://www.etsy.com/it/listing/154120127/bracciale-in-chainmail-steampunk-nero-e? I really like the purple and green chain mail bracelet. I love the Beaded Chainmaille Bracelet, Purple and Lavender Full Persian Anodized Aluminum Chainmail Bracelet. I like Chainmaille Bracelet, Lavender and Purple Clockwork Chainmail Bracelet, Bright Aluminum and Anodized Aluminum. I like the Chainmail Statement Jewelry, Green and Silver Ladder Byzantine Necklace with 18K White Gold Plated Green Jade Gemstone Pendant. I like the chainmaille choker in black and red- definitely makes a statement. I like the Chainmail Jewelry, Blue, Violet and Pink Rondo al a Byzantine Anodized Aluminum Chainmaille Bracelet. My favorite item is: Chainmaille Bracelet, Box Chain Weave, Handmade Silver and Ice Anodized Aluminum Chainmail Bracelet. The chainmaille bracelette in red is my favourite! How gorgoeus, very creative and stylish, I love this bracelette! I like all the bracelets but especially the Steampunk Chainmail Bracelet, Green and Red Japanese Stepping Stone. I like the Chainmaille Necklace, Byzantine Chainmail Necklace, Blue, Gold and Green Necklace....but all the items are beautiful! Name is Patty Simpson.....to match my Etsy name. 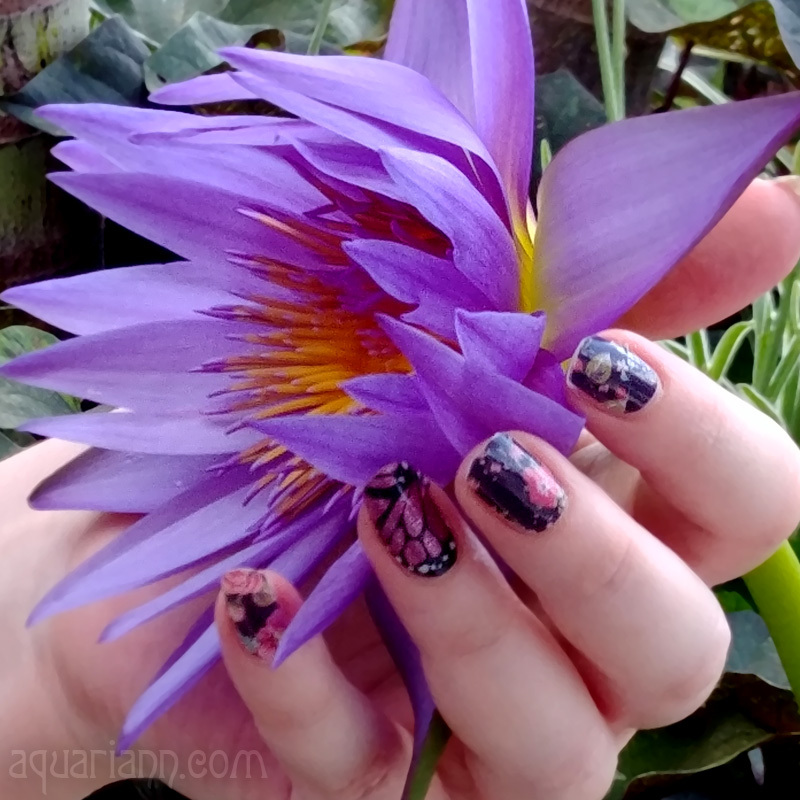 I love the Scale Flower Hair Clip - it is just beautiful - thanks! The pink & violet bracelet is nice. I like the steam punk chainmail bracelet in black. I love the Chainmaille Bracelet, Green and Seafoam Clockwork Chainmail Bracelet, Bright Aluminum and Anodized Aluminum. Its gorgeous! I love the flower hair clips. There are so many great colours to choose from! I love their Scale Butterfly Barrette in Pink! I really like the Chainmaille Necklace, Gold, Orange and Red Olivia Chainmail Statement Necklace.